MADE SPECIFICALLY FOR OUTDOOR PE CLASSES AND PARK AND REC. DEPTS! 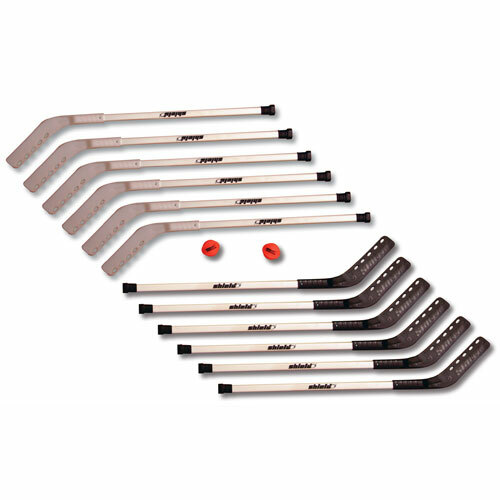 These hockey sets are designed exclusively for use on asphalt and concrete. Most floor hockey sets are made for use indoors and quickly wear out when used on the hard playground. These sets feature extra thick outdoor plastic blades that will last for years. Available with strong wood, plastic and aluminum shafts. Each set includes 12 36" PLASTIC sticks - (6 White blades/6 Black blades), 2 speed control balls and 1 instruction booklet. Blades are not to be used on gymnasium floors.